Over the past few months, we have seen continued attacks and outright sabotage on the Affordable Care Act (ACA) from the Trump administration. After last summer’s failed attempt to repeal and replace the Affordable Care Act through a bill sponsored by Senators Lindsey Graham (R-SC) and Bill Cassidy (R-LA), the administration moved to try and end protections through the rule-making process in the department of Health and Human Services. While the implications of the new rules are serious, and will likely cause millions of people to lose or be priced out of healthcare coverage, there is a new legislative threat looming that is eerily similar to the Graham-Cassidy plan that we saw last summer. The good news is that this is still just an idea from a conservative think tank. However, as we have seen before, Republicans in the House are serious about taking away healthcare coverage and protections from the most vulnerable. There is concern that if this horrible idea becomes a bill, it could move quickly this summer due to a process called budget reconciliation. In this process, the budget could include instructions that would allow for Congress to pass a bill with only 51 votes, instead of the normal 60 vote majority. This is what happened last summer when the “repeal and replace” bills nearly passed in the Senate. 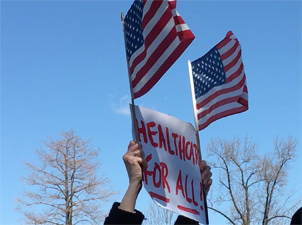 As people of faith, we believe that healthcare is a human right. When proposals like this threaten to take away access to healthcare from the most vulnerable among us, we will fight to stop it. We will be monitoring this situation closely to ensure that this proposal does not become a bill. If it does become a bill, we will mobilize and act to prevent it taking healthcare away from millions. This entry was posted in Front Page, Healthcare, Policy Update on July 2, 2018 by Kaitlin.